Premium 3/8" thick wood chair mats add style to any work area. Made to cover both carpeted and hard surfaces, these wood laminated chair mats protect all types of floors and facilitate chair movement while staying put on any surface. Available in Cherry, Oak and Walnut. "Solid, 1-piece construction 46x46 Walnut Square. 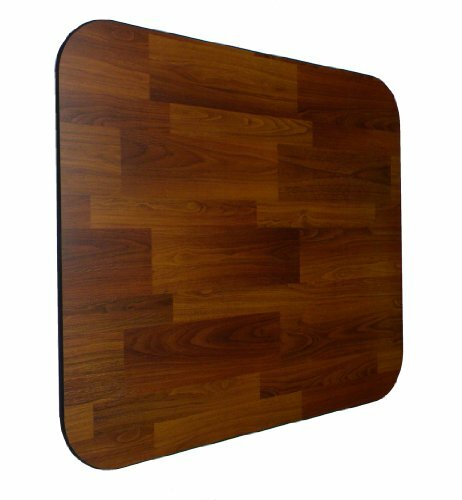 ( See Dimension Diagram Under Main Image)"
3/8" thickness ensures this wood chair mat won't crack, dimple, or break. Ships flat and is a solid non-bendable design that simulates a hard floor surface. Each mat is hand-made and tested in the USA to ensure the highest quality. Beautiful Black Rectangle Chair Mat for carpeted surfaces, Straight Edges, rounded corners, size 48" W X 72"